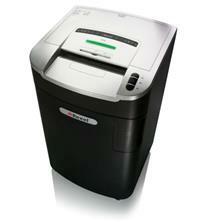 The Rexel Mercury RLX20 is a cross-cut office shredder capable of shredding up to 22 sheets of 70gsm paper at a time. Designed for the busy large office with over 20 users, it has a P-4 DIN security rating so is suitable for the shredding of highly confidential documents. The shredder will also shred credit cards and CDs/DVDs and even comes with a tray to separate this waste from paper, making recycling much easier. Other eco-friendly measures include auto shut down after 2 minutes of non-use, thereby saving power and the ability to use recyclable shredder bags (Rexel recyclable paper waste sacks, product code 2102248). Jam-free technology is a handy feature which means the shredder will only accept a set number of sheets to be shredded at a time. If this number is exceeded, an alert will tell you to reduce the stack. In the unlikely event of a shredder jam though, there is also a reverse function to help you clear it. Bin capacity on the RLX20 is 115 litres (which will take up to 1100 shredded sheets) and the bin is easy to empty thanks to the shredder's pull-out frame. An auto oil system lubricates the cutters at set intervals so you don’t need to think about when to oil it. Simply replace the oil (Rexel product code 1760049) when prompted.